Please be careful when combining Goethe's autobiographical works - the various editions of "From My Life: Poetry and Truth" (Aus Meinem Leben: Dichtung und Wahrheit) contain differing portions of the complete work. Vol. 5 in the Princeton Edition containing Part 4 is a DIFFERENT work from vol. 4 containing Parts 1-3, the latter being similar to most other editions which are allegedly complete but contain only those first three Parts. Johann Wolfgang Goethe, De la meva vida. Poesia i veritat. Johann Wolfgang von Goethe's book The Madwoman on a Pilgrimage was available from LibraryThing Early Reviewers. 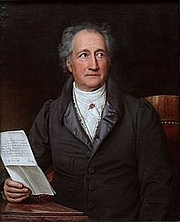 Johann Wolfgang von Goethe is currently considered a "single author." If one or more works are by a distinct, homonymous authors, go ahead and split the author. Johann Wolfgang von Goethe is composed of 43 names. You can examine and separate out names.